Ladder ball games, or as its sometimes know , ladder golf sets, is a fun indoor and outdoor game with a couple of simple rules. How is it played? Essentially each player has 3 bolas and they throw these bolas attempting to catch them on a rung from 15 ft. away. The top rung is worth 3 points, the second 2 points and the bottom rung is worth 1 point. After each round the points are totaled from the bolas still attached, and not knocked off, the ladders, with the high score winning. The game is ideal for children and adults, and is a frequent staple of family reunions and backyard barbecues. If you are in the market for a ladder ball game ladder, we've got you covered. The 22 lb., steel Maranda Enterprises Ladderball set is our top pick- it ships with 3 red and 3 blue bolas, includes a handy storage and carrying bag, and buyers commend its excellent durability and quality. Many users had upgraded to this metal set from a plastic set they particularly like that the ladder bolts together, which means that it will not fall apart while you are chucking bolas at the ladder. Watch the Maranda LadderBall set in action! A few users complained that the bolas themselves wear out after a couple of weeks and that they had to purchase replacements. As well a minority of users complained that assembling and reassembling the unit multiple times caused the screw threading to wear out. In all, this is a sturdy ladder ball toss set that is sturdily constructed and actually win the 2010 game of the year award from Creative Child magazine. That said, Let's take a look at five of the best type and selling ladderball games the market and see how they compare. The GoSprorts premium ladder toss game is a sturdy product, well-made and durable, that you can enjoy for hours. What users love the most about this ladder golf game is that you can assemble it very quickly, play within minutes and that it comes with a zip-up carrying case. But some note that the quality of the targets is not very good. This ladder ball game includes two 2.5mm PVC ladder ball targets, 3 red and 3 blue bolas made from real golf balls and thick ropes, ladder ball rules and a carrying case so that you can enjoy this ball on string game anywhere. Overall, it seems like a good option, if you are on the lookout for a ladder toss set. Users generally have a positive opinion of this golf ball toss game and they comment that the set is easy to assemble, transport and storage. The customers share that the ladder ball targets seem sturdy, strong and hold together well. One user shares that his son absolutely loves the game and he has no problem with the frame falling down. This buyer finds it very convenient that he is able to take the ladder ball set anywhere he wants and that the customer service is very helpful and fast responding. However, some other purchasers have complained that the golf ball toss game arrived with missing or broken pieces and they weren’t very happy with the quality of the PVC ladder targets, which would break after a few games. This backyard ladder ball lawn game offered by Ideals in Life isn’t a good choice for you if you want to play with an opponent. Many users have complained that they received only one target for a high price and that it was useless to them without a second set. But other pleased customers love that this outdoor ball toss game is easy to set up, fold and store. It contains only one 36×23.5 inches ladder ball target with 3 goal setting and 3 bolas, but it’s lightweight and can be used almost everywhere – on the beach, during parties and outdoor events. Customers are generally unhappy that this golf ball throwing game doesn’t have a second set and the quality isn’t what they expected. 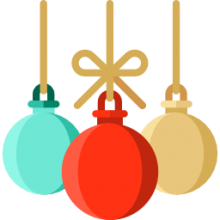 One buyer shared that he felt cheated when he received a ball toss game with cheap plastic quality and only one set of blue balls, so it was impossible for two people to play. Another user states that the worst thing about this ladder ball game set is that the ladder target is too light and it falls off when you throw a ball at it, while another comments that the pieces are so fragile that they would crack if you step on them by accident. 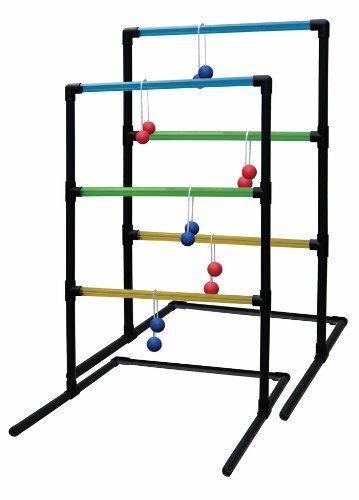 This metal ladderball game offered by Maranda Enterprises is well-built, durable and a good choice if you are looking to play ball toss game. Users love that the ladder ball targets are very well-constructed, made from metal, but easy to set up. However, some customers have noted that the ladder set is quite heavy and it’s not easy to carry it. 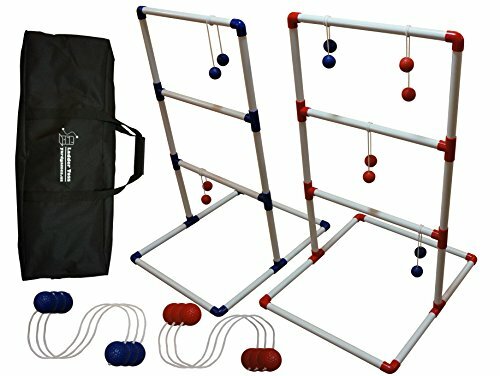 This toss ball ladder game contains 2 metal ladder ball targets, 2 sets of bolas – 3 red and 3 blue, ladder ball set up instructions and a canvas bag for storage and carrying, so it seems like a good choice if you want to try the golf ball throwing game. Users generally share very positive opinions of the Maranda Enterprise metal ball ladder game – they say the metal ladder targets are sturdy enough and they are pleased with the quality and the price. One customer claims that this is the best ladder game set that he has encountered, because the metal ladder target doesn’t move at all during game play and the bolas are quite durable. This buyer also states that he uses it regularly and would recommend it to anyone looking for a ladder golf game. Another purchaser comments that he was worried about whether the holes would align, but he was amazed that he managed to assemble the ladder golf set for only 5 minutes with ease. However, some users have complained that the soft, plastic balls start to leak sand after a few games and advise that you replace the ladder balls with harder ones. The Premium ladder toss set is well-constructed and easy to set up product with a great design that would allow you to play for hours your favorite game. Users love that the ladder set can be quickly and easily assembled and that it has its own polyester carrying case, but they also note that the ladder targets are light and may fall off during playtime. 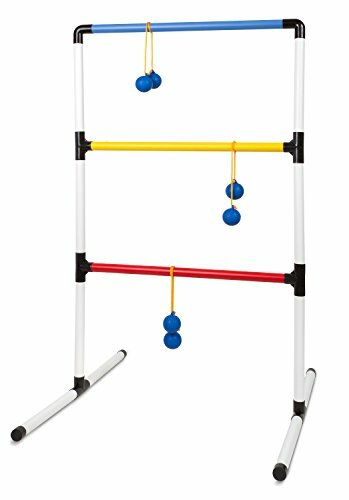 This ladder toss set includes 2.5mm PVC ladder targets, 3 red and 3 blue bolos, made from real golf balls and quality ropes and ladder ball set up instructions. So it seems like a good choice if you are looking for a quality set. Overall the users are happy with the quality and performance of the premium ladder set –they say that the PVC ladder targets are sturdy and easy to put together. Moreover, they say the carrying case is very durable and the ladder toss set doesn’t weigh much, so it won’t be a problem to carry it anywhere. One user shares that he is very pleased with the quality and value of the ladder ball game set and he would recommend it without a second thought. Another customer comments that he didn’t have any problems using the set on the beach and that the game was fun to play. However, some purchasers are disappointed, because the outdoor ball game set arrived with missing or broken pieces. They also advise that it would be a good idea to include actual ball toss game rules in the package. The Triumph Sport transparent ladder toss is stylish, well-built and durable, and could bring you hours of play and entertainment. Users love that the ladder targets are lightweight, sturdy and easy to assemble without any tools. But some do note that the bolos have a rubbery texture and would slide off the ladder. 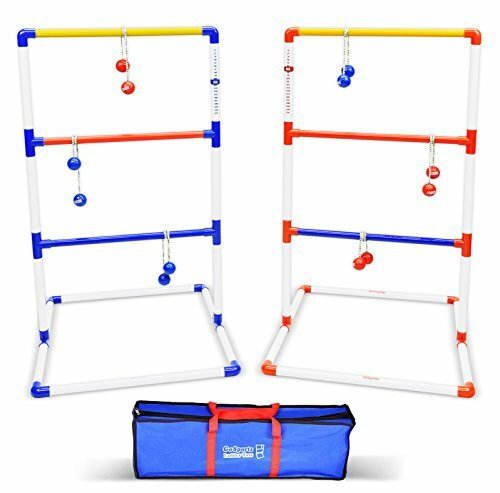 With a fully weighted base for stability and a scoring system, this ladder game toss includes also 6 bolos – 3 blue and 3 red and a carrying bag for transport. Overall it seems like a low-cost product with an average quality. Buyers have a mixed reaction concerning the Triumph Sports game toss set – some are extremely pleased with the quality, while other users claim that their ladder game broke only after a couple of games. One user shares that he plays it regularly without worrying that somebody would get hurt due to the light balls. Another pleased customer notes that the outdoor ladder ball toss performs very well even on uneven ground, while another reviewer advises against taking it down after each game to avoid damage. An unhappy customer, on the other hand, complains that the ball toss game broke on the first throw and the quality of the plastic is very cheap and flimsy. WHAT ARE BACKYARD CHICKEN COOPS? Ladderball is a fun and engaging game that can be played with children or adults in your backyard, on the beach, at tailgate parties, and even indoors-if you have the space for it. It's a great game to play if you can separate into teams- so this is good for 2 to 4 players at a time, with many users describing rotating multiple teams to accommodate large groups at family reunions and backyard barbecues. Users do say that sometimes the bolas that come with the ladder ball lawn game wear out, or get lost, so they typically stock up with a few extra sets when they check out online after making their purchase of the ladder ball game set itself. Metal or plastic ladderball sets? 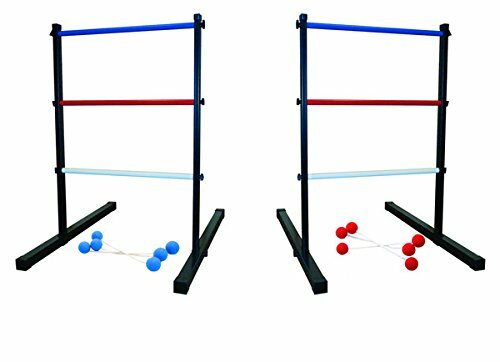 There is some debate online between purchasing a plastic or metal version of the ladder toss set-the metal set is sturdier and a bit less forgiving, while the plastic is lighter with more give for the bolas. As well there is some ladder ball at a kit that you should be familiar with- Tosso.com, a common reference point for ladder ball rules, says that making noise and generally distracting the opposing team is encouraged, however you are not allowed to touch the posing player or their bolas. Indeed, there has been a bit of a craze about these ladder ball games recently, and their manufacturers have picked up on this trend producing a variety of different styles of ladder ball lawn games-some of them even made from wood! For the most part, they are easy to assemble and parents often credit them with supplying their children with much-needed outdoor activity in a safe, but competitive, away. Make sure that you understand how to play ladder ball, or ladder golf, as some people refer to it, prior to playing- it's pretty simple but you will have more fun if you investigate the rules a bit. If you are in the market for one of these indoor-outdoor ladder ball toss games, check out our reviews above, click through our comparison table, and examine what other ladder ball tossers have said about the products they bought!